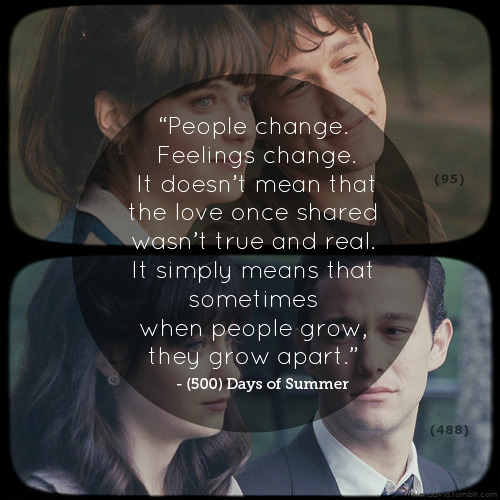 This above quote is what I thought of immediately after I watched 500 Days of Summer. The narrator was right, this is NOT a love story, but this is a story about love. As similar as it sounds, there really is a stark difference between the two. Summer and Tom, I really think they're soulmates. But they're not meant to be together. Summer broke down his defenses, reignited his passion for architecture; while Tom broke down her emotional barriers, and made her rethink love. There are a few things that I really love about this film. The music is really fantastic, the soundtrack is amazing. I love the oldies and the mood it brought to the whole film. Secondly, I love the whole film presentation, how it shows you snippets of their 500 days together, the whole compare and contrast thing is a pretty refreshing take that I enjoyed greatly. 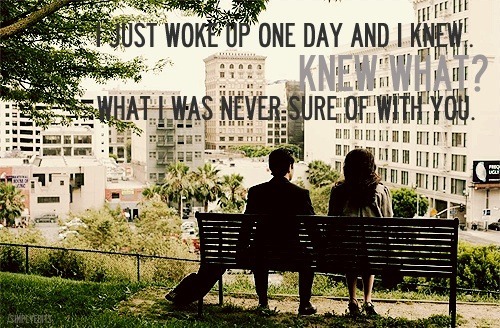 Thirdly, I love the movie quotes that spoke volumes about life and love. They are so real, so close to the reality we know, and so amazingly true. Here are a few of my favourite quotes from the film. This really tugged at my heartstrings, because I guess it wasn't just applicable in love but in every aspect of a relationship you had. This one really struck a chord with me, because I guess it's something that I've always grappled to understand. A good friend tried a few times to explain this concept to me, but it was always kinda distant, like I couldn't really understand what he meant. But after watching this film, everything just clicked into place. I guess I can understand how Summer felt because with love, it's not just about the right person, it's also about the right timing. The timing has to be right before you can have a Summer Epiphany like the one shown in the photo above. And lastly, this quote made by this cute little girl in the film. As with all relationships that ended, we all go into a flashback of all the memories and strangely all that we remember are the good stuff. There's always been alot of arguments about how people hated Summer for ditching Tom for "no reason at all". But I really love Summer, her courage to be able to end a relationship that is not serving her or growing her at all. It's like this quote by this great author Milan Kundera, when you love, you can't expect to be loved. People think that as long as your love is sincere and true, the other party has to reciprocate. And if they doesn't, they're deemed the bad guy. Everyone thinks Summer is the bad guy in this film, the weak one escaping commitment. But ya know what I think? I think Summer is the brave one, the one with her eyes wide open, the one who knows what she wants. It's not that she doesn't want to commit, it's because Tom is not the right person for her to commit to. And it takes real courage to be able to face up to that kind of realization, and to be able to make that kind of decision, especially when she's in love with Tom. I love this film so much, I think it'll be great to watch it again soon. I don't have alot of movies that I'll love to watch again and again, but this is definitely on the list.